Tai Chi is perfect for increased flexibility, superior balance, sustained stability, and arthritis relief. 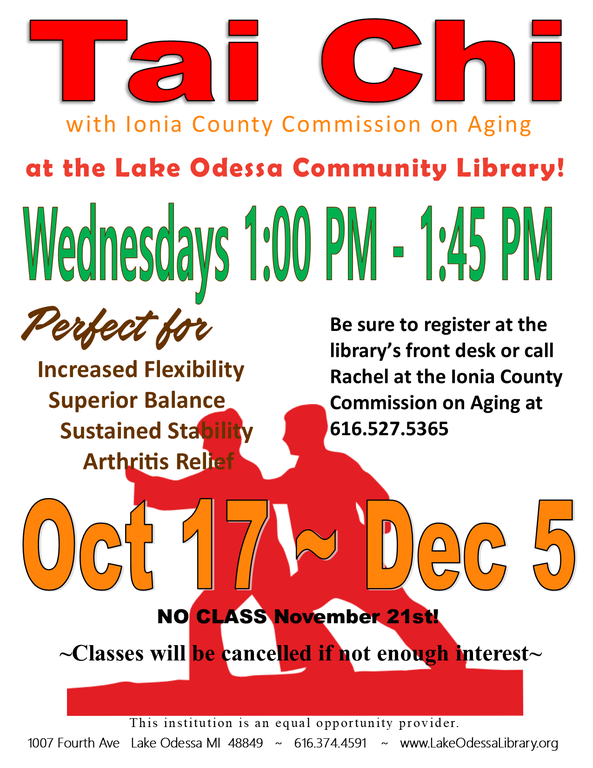 Join Rachel of the Ionia County Commissin on Aging for this class at the library. Please register by calling Rachel at 616.527.5365 or the library at 616.374.4591. All dates Oct 24, 2018 from 01:00 PM to 01:45 PM Oct 31, 2018 from 01:00 PM to 01:45 PM Nov 07, 2018 from 01:00 PM to 01:45 PM Nov 14, 2018 from 01:00 PM to 01:45 PM Nov 28, 2018 from 01:00 PM to 01:45 PM Dec 05, 2018 from 01:00 PM to 01:45 PM There are 1 more occurrences.